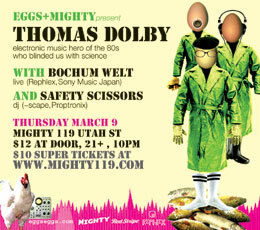 I have just discovered that one of my favourite artistes of all time, the one and only Thomas Dolby, will be playing one of his very rare gigs in San Francisco when we are there next month - at Mighty on Thursday the 9th. W00t! I am so there. Anyone else likely to be going? Only $10? I'd have paid a lot more! I just bought a ticket! Thank you so much for posting this!